Recessed lighting is widely used for illuminating residences and offices, providing a lot of light while adding a contemporary touch to your decor. Also known as can lights or pot lights, recessed lighting is a downlighting fixture that installs into an opening in the ceiling. There are three parts of recessed lighting: housing, trim, and the bulb. • Housing: This is the main protective structure of the fixture that is hidden in the ceiling and holds all of the necessary electrical components. • Trim: The decorative molding that covers the opening of the light. • Light Source or Bulb: A range of bulb types are used in recessed lighting, from wide flood style to tightly focused halogen bulbs. In the case of LED retrofit trims, the light source is integrated into the trim so no bulb is needed. 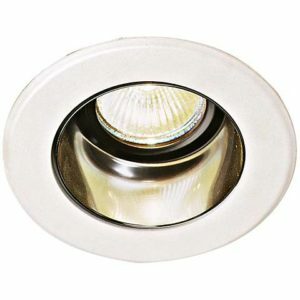 LED Retrofit Kits are an easy way to update older recessed fixtures to energy-efficient LEDs. Designed to replace existing trim, they are simply screwed into the bulb socket and held in place with clips. Recessed lighting means extra lighting when and where you need it. There are two basic types. Which one you need depends on how they are being installed. For use in construction spaces before the sheetrock or drywall ceiling has been installed. They use hanger-bars to attach to the ceiling joists. These are smaller and intended for areas where ceiling access is limited. They are installed through a small hole cut in the drywall or sheetrock and are held in place with clips to the ceiling drywall. Housings also have an IC or “Insulation Contact” Rating that you’ll want to keep in mind. Be sure your choice will pass the building codes in your area. For use where the housing will be in contact with insulation material. These are designed with extra heat shielding, allowing insulation to cover the housing. These do not offer the same level of heat protection, so they are used in un-insulted ceilings. 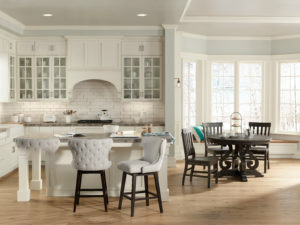 These systems connect into your home’s standard 110-120 volt feed, just like any other ceiling light. These use a transformer that converts or steps-down your home’s regular current to a lower voltage, commonly 12 volts. They typically offer a more controlled, focused beam of light. A recessed light can add focused light to your space. When choosing recessed light trim, make sure it’s the same size, brand, and product family as the housing. There are a number of different types of trim, each with its own unique advantages. • Baffle Trim has a ribbed interior that minimizes glare. • Reflector Trim has a reflective interior to amplify the illumination. • Gimbal Trims pivot and adjust to focus light where you want it. Good for art and other wall decorations. • Wall Wash Trim uses a scoop to direct and confine light to a specific area of the wall. Lights should be placed 4 to 6 feet apart for general room lighting. For task lighting over countertops and other workspaces, lights can be closer together, at 1 to 2 feet apart. For artwork, use an angled gimbal trim to direct the light as needed. To minimize glare, the beam should be at a 30-degree angle when directed toward the center of the artwork. Dimmers add extra versatility and ambiance to your system. For LEDs, be sure to use an LED compatible dimmer. Line voltage systems with incandescent bulbs work with a standard wall dimmer. If you have an angled or sloped ceiling, look for these specially designed housings and trim. For showers and covered outdoor spaces, use housings and trim rated for enclosed shower use. They are designed to protect critical electronic components from exposure to moisture and steam. These are sealed to keep heated air from escaping through the fixture and are recommended if installing lights on top floors.